It’s the question that consumes Warren Gatland’s thinking as Welsh rugby enters a defining year. Born in New Zealand to a Welsh mother, Gareth Anscombe’s decision to come over and play for the Cardiff Blues with the intention of forcing his way into Warren Gatland’s Wales squad has led to great excitement around the country. A talented back, comfortable at both full-back and fly-half – Gatland’s persistence paid off when Anscombe decided to leave the country of his birth to follow a path that may lead him to wearing the legendary Welsh No.10 jersey at the 2015 World Cup. So how has he fared in his first few games. Well after being thrown straight into the No.10 jersey for the Cardiff Blues, Anscombe has shown glimpses of class with ball in hand, but has equally been suspect with his decision-making. A worthy example being the recent European Challenge Cup defeat to London Irish. In a 34-23 defeat, Anscombe both scored and conceded a try with Shane Geraghty scoring under the posts after successfully charging down Anscombe’s kick, before the Blues No.10 gave his side a lifeline with a try late on. It is this reason why many Welsh fans believe that the upcoming Six Nations will come too soon for a young man who played the majority of his rugby back in New Zealand at full-back. 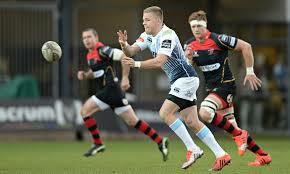 However, to write off Gareth Anscombe is to ignore his undoubted talent. Having played over 30 games in Super Rugby for both the Auckland Blues and secondly, the Waikato Chiefs, at the age of 23, Anscombe has already proven his ability at the top level. The Super 15 remains the only league in the world that comes anywhere close to the standard of international test rugby. The speed of thought and execution by it’s players make it the most entertaining club competition in rugby union. In 2013, the Waikato Chiefs achieved the rare feat of defending their Super Rugby crown of 2012 after coming from behind to beat the Brumbies 27-22 in Hamilton. Their full-back on that day: Gareth Anscombe. Having beaten off competition from team-mates for the No.15 jersey, Anscombe proved a key performer throughout the season with both ball in hand as well as his goal-kicking, as the Chiefs swept all before them for the second consecutive year. At this point the next obvious step for Anscombe would be to work his way into international rugby with New Zealand, but with the All Blacks current squad arguably one of the greatest rugby teams of all-time, chances have been slim for Anscombe. With the likes of Aaron Cruden, Dan Carter and Beauden Barrett vying for the much coveted fly-half berth, it soon became clear that Anscombe was going to struggle to break in ahead of the upcoming World Cup. Warren Gatland’s decision to persuade Anscombe to come over and compete with the likes of Dan Biggar, Rhys Priestland and James Hook for the Welsh No.10 jersey has been questioned by many. The idea of bringing in a player and pushing him straight into international reckoning is a dangerous one in a World Cup year. However Anscombe’s performance in the recent derby win over the Newport Gwent Dragons, may just have vindicated Gatland’s intuition. In a dire derby display from both teams, Anscombe proved the difference with a display of calm authority and class. It was Anscombe’s beautifully-weighted miss pass that allowed Blues centre Cory Allen to get on the outside of his marker and run in for a simple score that gave the Blues a platform from which to build upon. From there Anscombe took the game away from the Dragons with a penalty and an expertly-taken drop-goal. Sitting in the stands watching the game it was Anscombe’s creative ability and spark which caught my attention. At one point in the second half, the No.10 took the ball and with little thinking, spotted the gap in front of him and burst over the gain line, skipping away from defenders before eventually being brought down close to the try line. 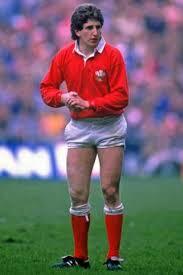 It was a performance of skill and subtlety rarely seen over the years by a Welsh outside-half. Both Rhys Priestland and James Hook have shown glimpses of this ability in a Welsh jersey, but on far too rare an occasion. With Dan Biggar growing in confidence following a strong Autumn for Wales, the No.10 jersey for the Six Nations will go to him on merit. Yet while Biggar has improved dramatically in the past year, his main strength remains his ability to control a game with his kicking as well as his decision-making. Anscombe may still struggle with his decision-making and discipline as a fly-half, but his ability to spark a backline into action with his wonderful passing and his deceptive running from fly-half make him a strong contender for the reserve fly-half spot. Over the years, Welsh rugby has been searching in vain to find a fly-half with that magic spark provided in the past by the likes of Phil Bennett and Jonathan Davies, and having cast their net a little bit wider than usual, may have found the answer. ← Momentum shift or temporary lapse?